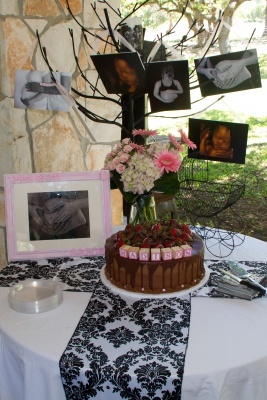 Lisa’s baby shower was held at the beautiful Retreat at Faithville. The shower was lovley with black and white table settings with hot pink acccents. Each custom flower arrangement had a picture placed in it from either Lisa’s maternity or the baby’s ultrasound. Lisa was glowing with her family and friends surrounding her as they celebrated. The games included a nursery rhyme challenge and a “dirty” diaper guessing game, both made for very fun photos. We are excited for Lisa and cannot wait to see the little one when she arrives, congratulations Lisa!